Savor some of the best Dalmatian-area wines during this 50-minute wine tasting session with snacks hosted at a local Split eatery. Sample two of the region’s best vintages accompanied by small bites like olives, cheese, prosciutto, and more, learning about the grape picking and wine production process as you taste. Pick your preferred starting time from the available options and then head to the Diocletian Wine House Restaurant. Savor the atmosphere of the restaurant as you sit down for your tasting session featuring some of the best Dalmatian wines. Enjoy the complex flavors of two of the region’s most famous local wines, pairing them with an included assortment of olives, cheeses, and prosciutto. 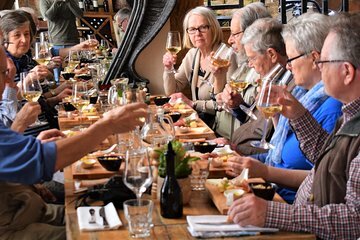 While you taste and snack, you’ll also be able to fill your head with new knowledge about the wine production process for this unique winemaking area.